Karaite ḥakam; born at Adrianople about 1420; died there in 1490. 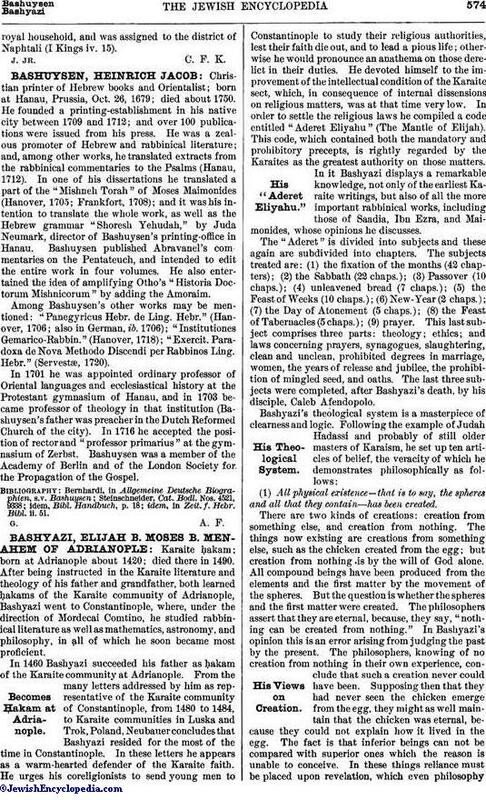 After being instructed in the Karaite literature and theology of his father and grandfather, both learned ḥakams of the Karaite community of Adrianople, Bashyazi went to Constantinople, where, under the direction of Mordecai Comtino, he studied rabbinical literature as well as mathematics, astronomy, and philosophy, in all of which he soon became most proficient. In 1460 Bashyazi succeeded his father as ḥakam of the Karaite community at Adrianople. From the many letters addressed by him as representative of the Karaite community of Constantinople, from 1480 to 1484, to Karaite communities in Luska and Trok, Poland, Neubauer concludes that Bashyazi resided for the most of the time in Constantinople. In these letters he appears as a warm-hearted defender of the Karaite faith. He urges his coreligionists to send young men to Constantinople to study their religious authorities, lest their faith die out, and to lead a pious life; otherwise he would pronounce an anathema on those derelict in their duties. He devoted himself to the improvement of the intellectual condition of the Karaite sect, which, in consequence of internal dissensions on religious matters, was at that time very low. In order to settle the religious laws he compiled a code entitled "Aderet Eliyahu" (The Mantle of Elijah). This code, which contained both the mandatory and prohibitory precepts, is rightly regarded by the Karaites as the greatest authority on those matters. 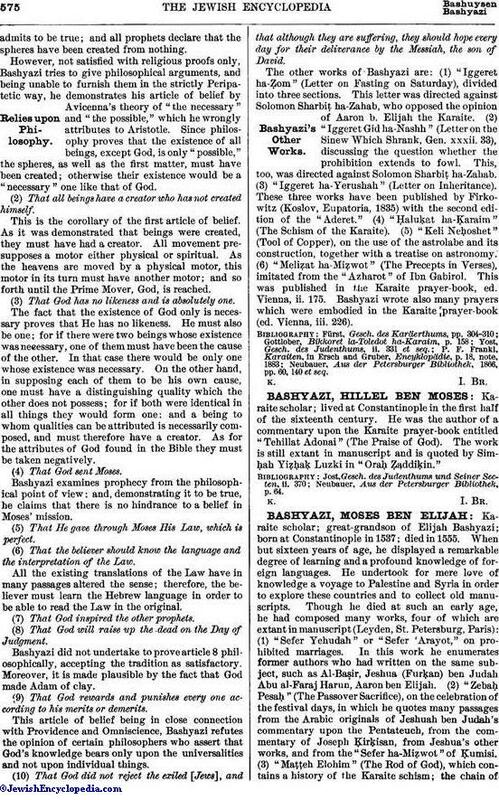 In it Bashyazi displays a remarkable knowledge, not only of the earliest Karaite writings, but also of all the more important rabbinical works, including those of Saadia, Ibn Ezra, and Maimonides, whose opinions he discusses. The "Aderet" is divided into subjects and these again are subdivided into chapters. The subjects treated are: (1) the fixation of the months (42 chapters); (2) the Sabbath (22 chaps. ); (3) Passover (10 chaps. ); (4) unleavened bread (7 chaps. ); (5) the Feast of Weeks (10 chaps. ); (6) New-Year (2 chaps. ); (7) the Day of Atonement (5 chaps. ); (8) the Feast of Tabernacles (5 chaps. ); (9) prayer. This last subject comprises three parts: theology; ethics; and laws concerning prayers, synagogues, slaughtering, clean and unclean, prohibited degrees in marriage, women, the years of release and jubilee, the prohibition of mingled seed, and oaths. The last three subjects were completed, after Bashyazi's death, by his disciple, Caleb Afendopolo. (1) All physical existence—that is to say, the spheres and all that they contain—has been created. There are two kinds of creations: creation from something else, and creation from nothing. The things now existing are creations from something else, such as the chicken created from the egg; but creation from nothing is by the will of God alone. All compound beings have been produced from the elements and the first matter by the movement of the spheres. But the question is whether the spheres and the first matter were created. The philosophers assert that they are eternal, because, they say, "nothing can be created from nothing." In Bashyazi's opinion this is an error arising from judging the past by the present. The philosophers, knowing of no creation from nothing in their own experience, conclude that such a creation never could have been. Supposing then that they had never seen the chicken emerge from the egg, they might as well maintain that the chicken was eternal, because they could not explain how it lived in the egg. The fact is that inferior beings can not be compared with superior ones which the reason is unable to conceive. In these things reliance must be placed upon revelation, which even philosophyadmits to be true; and all prophets declare that the spheres have been created from nothing. However, not satisfied with religious proofs only, Bashyazi tries to give philosophical arguments, and being unable to furnish them in the strictly Peripatetic way, he demonstrates his article of belief by Avicenna's theory of "the necessary" and "the possible," which he wrongly attributes to Aristotle. Since philosophy proves that the existence of all beings, except God, is only "possible," the spheres, as well as the first matter, must have been created; otherwise their existence would be a "necessary" one like that of God. (2) That all beings have a creator who has not created himself.This is the corollary of the first article of belief. As it was demonstrated that beings were created, they must have had a creator. All movement presupposes a motor either physical or spiritual. As the heavens are moved by a physical motor, this motor in its turn must have another motor; and so forth until the Prime Mover, God, is reached. (3) That God has no likeness and is absolutely one.The fact that the existence of God only is necessary proves that He has no likeness. He must also be one; for if there were two beings whose existence was necessary, one of them must have been the cause of the other. In that case there would be only one whose existence was necessary. On the other hand, in supposing each of them to be his own cause, one must have a distinguishing quality which the other does not possess; for if both were identical in all things they would form one; and a being to whom qualities can be attributed is necessarily composed, and must therefore have a creator. As for the attributes of God found in the Bible they must be taken negatively. (4) That God sent Moses.Bashyazi examines prophecy from the philosophical point of view; and, demonstrating it to be true, he claims that there is no hindrance to a belief in Moses' mission. (5) That He gave through Moses His Law, which is perfect. (6) That the believer should know the language and the interpretation of the Law.All the existing translations of the Law have in many passages altered the sense; therefore, the believer must learn the Hebrew language in order to be able to read the Law in the original. (7) That God inspired the other prophets. (8) That God will raise up the dead on the Day of Judgment.Bashyazi did not undertake to prove article 8 philosophically, accepting the tradition as satisfactory. Moreover, it is made plausible by the fact that God made Adam of clay. (9) That God rewards and punishes every one according to his merits or demerits.This article of belief being in close connection with Providence and Omniscience, Bashyazi refutes the opinion of certain philosophers who assert that God's knowledge bears only upon the universalities and not upon individual things. (10) That God did not reject the exiled [Jews], and that although they are suffering, they should hope every day for their deliverance by the Messiah, the son of David. The other works of Bashyazi are: (1) "Iggeret ha-Ẓom" (Letter on Fasting on Saturday), divided into three sections. This letter was directed against Solomon Sharbiṭ ha-Zahab, who opposed the opinion of Aaron b. Elijah the Karaite. (2) "Iggeret Gid ha-Nashh" (Letter on the Sinew Which Shrank, Gen. xxxii. 33), discussing the question whether the prohibition extends to fowl. This, too, was directed against Solomon Sharbiṭ ha-Zahab. (3) "Iggeret ha-Yerushah" (Letter on Inheritance). These three works have been published by Firkowitz (Koslov, Eupatoria, 1835) with the second edition of the "Aderet." (4) "Ḥaluḳat ha-Ḳaraim" (The Schism of the Karaite). (5) "Keli Neḥoshet" (Tool of Copper), on the use of the astrolabe and its construction, together with a treatise on astronomy. (6) "Meliẓat ha-Miẓwot" (The Precepts in Verses), imitated from the "Azharot" of Ibn Gabirol. This was published in the Karaite prayer-book, ed. Vienna, ii. 175. Bashyazi wrote also many prayers which were embodied in the Karaite prayer-book (ed. Vienna, iii. 226). Neubauer, Aus der Petersburger Bibliothek, 1866, pp. 60, 140 et seq.